Background: The creation and the maintenance of peri-urban forests with recreational sites are required for the sustainability of the urban environment. The formation of green networks between the peri-urban forests and the urban greenery is vital for a city, both for ecological and for recreational roles. The city of Thessaloniki lacks green infrastructure. 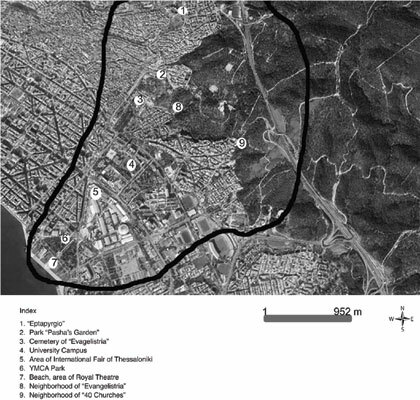 Recently, many studies have proposed landscape planning for Thessaloniki city. However, this study confronts the urban and peri-urban space as a whole. Objective: The purpose of this study is to form proposals for the connection of the peri-urban forest “Seih-Sou” with the green spaces of the city of Thessaloniki. The main project is the planning of a green network with the “Seih-Sou Forest” as a starting point and the seafront as an ending. Results: This proposed network will connect the existing green spaces at the center of Thessaloniki city. Then, the focus is transferred to a particular section of the proposed green network which spreads out from the “Seih-Sou” forest to the University Campus. Specifically, the proposal for the section “Seih-Sou” forest- University Campus is the aesthetical and functional unification of the green spaces: University Campus, Park of “Tellogleio” Foundation, “Pavlou Mela” Square, the row of trees at “Agathoupoleos” Road with the peri-urban forest. Keywords: Green networks, recreational forest, landscape ecology, environmental planning, fragmentation, city sustainability. Keywords:Green networks, recreational forest, landscape ecology, environmental planning, fragmentation, city sustainability. Abstract:Background: The creation and the maintenance of peri-urban forests with recreational sites are required for the sustainability of the urban environment. The formation of green networks between the peri-urban forests and the urban greenery is vital for a city, both for ecological and for recreational roles. The city of Thessaloniki lacks green infrastructure. Recently, many studies have proposed landscape planning for Thessaloniki city. However, this study confronts the urban and peri-urban space as a whole.